It seems appropriate that Jack Finney’s The Body Snatchers can contort and change with the times, as filmmakers are able to mold it into a reflection of an era’s anxieties. For 1950s audiences, Don Siegel’s Invasion of the Body Snatchers became an obvious metaphor for McCarthyism and the growing dread of suburban conformity. When Phillip Kaufman returned to Finney’s novel three decades later, the landscape was once again ripe for a parable about paranoia and identity crises. By 1978, the dream of the 60s revolution had all but faded, having been twisted and perverted into a nightmare by Vietnam and Watergate, leaving many Americans disillusioned. No wonder, then, that this take on Body Snatchers resonated with contemporary audiences who felt suffocated by shadowy conspiracies threatening to strip away their individuality by transforming them into a cog in a machine guided by unseen hands. Less a remake* and more a re-adaptation of the source material, Kaufman’s film transports the alien invasion tale to 1970s San Francisco, where a strange flower has begun to appear, bloomed from the spores of a species covertly invading from outer space. Their appearance is innocuous enough at first, health department employee Elizabeth Driscoll (Brooke Adams) is befuddled that it doesn’t appear in any botany research. Still, its threat is not obvious until her boyfriend (Art Hindle) starts to act disconnected and distant. He also takes cryptic, clandestine meetings with mysterious men Elizabeth doesn’t recognize. Alarmed, she brings her concerns to co-worker Matthew Bennell (Donald Sutherland), who soon begins to hear several similar stories. An eerie revelation comes over Elizabeth, Matthew, and their group of friends: just about everyone they encounter seems like a husk of an actual person, victims of a horrifying, extraterrestrial conspiracy to replace humanity with its own replicants. Kaufman’s film is marked by a distinct, eerie stillness: where you might expect an alien invasion tale to unfold with some manner of frenzy, this one resists such over-the-top hysterics, preferring instead to lull viewers into a grim, smothering inevitability. There’s an unsettling quietness to the entire film, from the perpetually shadowy photography to the almost droning, low-key sound design: it almost feels as though Invasion of the Body Snatchers is delivered by a hushed whisper, an approach that reflects the insidious, conspiratorial nature of the invasion itself. The suggestion is chilling: when the machine arrives to consume us, it will do so swiftly and silently. At no point does it feel like these characters have anything approaching a chance, and Kaufman pointedly observes folks from all walks of life being absorbed and subsumed: both Elizabeth and Matthew are government workers, while their friends (Jeff Goldblum and Veronica Cartwright) own a heath spa. One of the first alarms is set off by a humble laundromat owner who insists to Matthew that his wife is definitely not his wife but rather some sort of strange duplicate. Even a pop psychologist (Leonard Nimoy) is drawn into a sinister web that begins to form around this set of characters, each of them played with a quiet, understated dignity by a terrific cast. Even though it’s composed of movie stars, this feels like an authentic set of characters whose lives we just happen to bump into for a couple of hours. Their quiet desperation is an apt counterbalance to a film that slowly drains the life out them. Nimoy is an especially interesting casting choice. At this point, it’s fair to say that the shadow of Spock had stretched out over Nimoy’s career (to the point where his then recently-released memoir was titled I Am Not Spock by its publisher), and it shades so much of his performance here. In a movie that thrives on paranoia and suspicion, there’s something just off about Nimoy, almost as if he’s playing off his detached, Vulcan persona. That he plays a psychologist who constantly dismisses the group’s absurd assertions about an extraterrestrial invasion feels apt: here he is once again providing a calm, rational voice of logic. And yet, there’s something sinister about it here—certainly, you want to find some comfort in Nimoy in such a role, but it proves to be impossible. What a coup this is to twist one of the 60s most beloved icons into an unsettling figure here: not only is it brilliant on a basic, unnerving level, but it’s also reflective of the film’s aim to completely undermine whatever hope could possibly remain from the previous decade. Going straight for the heart of Gene Roddenberry’s optimistic future and undercutting it is perhaps the film’s most obvious but effective moment in this regard. Similar allegorical parallels abound: phone lines are tapped, cops are crooked, and somehow everyone is involved in a conspiracy that sends Matthew and company fleeing. Invasion of the Body Snatchers often has more in common with the likes of The Conversation and Three Days of the Condor than it does this era’s genre fare, especially during a climax that almost dissipates like a fog. Kaufman may stage the type of explosive set-piece you might expect from a movie of this ilk, though it hardly matters. Even as Matthew sets out to dismantle the conspiracy, you can practically feel the futility hanging in the air. When the audience sees him wandering the streets in the film’s infamous coda, a grim pessimism follows as he glimpses hordes of people reduced to drones in a hive-mind. Even the ambient noise and chatter is eerily hollow, as if the entire city of San Francisco has been drained of its vitality. It’s not only the film’s most unsettling moment, but also leads to one of the decade’s most iconic images, one that only hammers home that there’s no escape from being consumed. 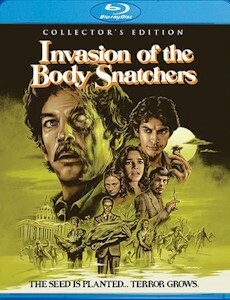 Invasion of the Body Snatchers is prescient in more ways than one, as it’s practically a prelude to the next decade’s preoccupation with re-appropriating 50s movies to fit modern sensibilities (and like those latter efforts, Kaufman’s film indulges in exquisitely disgusting effects work). Even more impressive, however, is its prophetic ability to sense the growing trend towards consumerism—by this point, it was obvious that America had been caught up in a willing consumption that certainly wasn’t about to cease. Once the final credits roll on Invasion of the Body Snatchers, you’ve heard the last mounds of dirt being shoveled over the 60s; around the corner, you hear the lurking, faint buzz of 80s excess and conformity. *Kevin McCarthy’s appearance—and apparent resumption of his role in the 1956 film—have led to many reading this film to be a sequel, however implausible that may be. Regardless, it's one of the best cameos/nods to sneak into a redux. As one of the most revered science-fiction horror films of all-time, it comes as no surprise that Invasion of the Body Snatchers has achieved Collector’s Edition Blu-ray status from Scream Factory—despite having already had one issued on DVD nearly a decade ago. But fret not: just as they have in the past when we’ve been skeptical about whether or not we really need a new edition of a landmark movie, Scream has more than justified the decision to add this title to its canon (plus, it just so happens that Invasion of the Body Snatchers is just that good). First of all, the transfer here is sourced from a new 2K scan of the interpositive, so it’s not merely the old transfer transported over to a different disc with a handful of new extras. Secondly, Scream has transported all of the previous special features over to this disc, including a commentary with Kaufman. Other holdovers include 16-minute retrospective “Re-Visitors From Outer Space,” separate featurettes focusing on the special effects, sound design, and cinematography, and the film’s trailer. Among the newly-produced material are four separate interviews with Adams, actor Art Hindle, writer W.D. Richter, and composer Denny Zeitlin. In addition to the trailer, Scream adds a photo gallery, plus radio and TV spots to round out the promotional material. Arguably the coolest addition here is “Time is Just a Place,” an episode of Science Fiction Theater directed by Jack Arnold and adapted from Finney’s story. No pod people enthusiast will want to be without this addition in particular, meaning Scream Factory’s is a definitive release that’s worth picking up even if you already own multiple copies of the film. The irony is not lost on me that I recommend you immediately buy another copy of a film that warns against hive-mind consumption, yet here we are.